During the winter my family loves classic home-style comfort food for dinner. 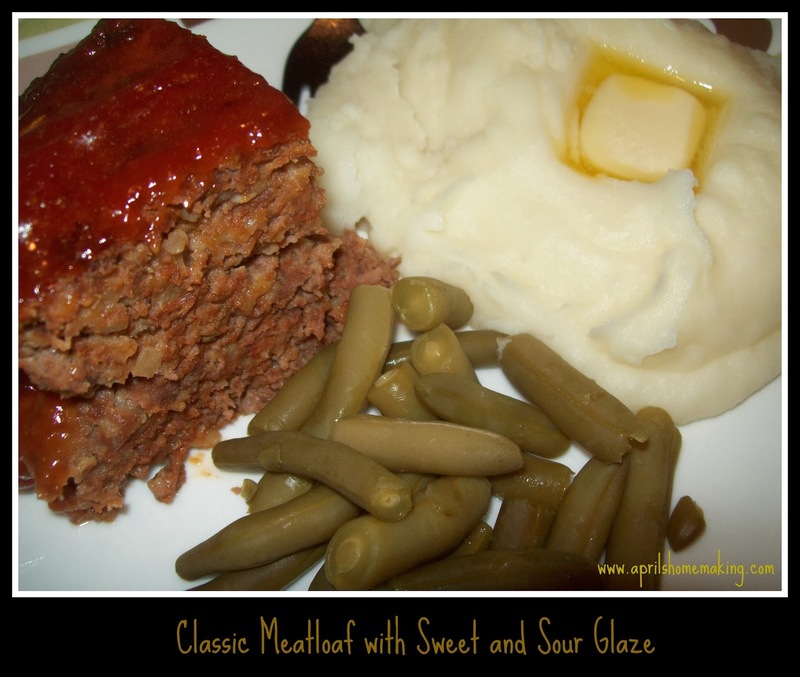 One of my family's favorite dinners is classic meatloaf, it always hits the spot! So I thought I would share my recipe. In a large bowl combine hamburger, spices, eggs, oats, and an entire sleeve of Ritz crackers crushed (they are easy to crunch with your hands as you add them in), and about 1/2 a cup of ketchup to begin. Using a fork mix the ingredients together until everything is well incorporated, add more ketchup as needed to create a mixture that will hold together well, and is moist but not overly moist. Add more herbs and minced onion if needed, since you can't taste raw beef I give it a good smell to see if it smells seasoned to my liking. Mix until incorporated. Then spray the bottom of a roasting pan with cooking oil, and mound the meatloaf mixture in the center of the pan. Using a fork, shape into an oblong loaf, like shown below. I like to use a fork because it leaves grooves in the meatloaf which will hold the glaze better later in the cooking process. Bake uncovered for about 45 minutes to an hour at 375 F., meatloaf should be browned but not crispy or dark, check it occasionally so it doesn't over cook on the outside, then it will be time to add the glaze. To make the sweet and sour glaze, combine 1/2 cup of ketchup, 1/2 a cup of brown sugar, and a couple tablespoons of yellow mustard into a bowl, and stir until mixed and sugar is incorporated. Then give it a taste, it may need more mustard, or ketchup, or even a bit more sugar, I like it to be sweet with a definite sour element from the mustard and ketchup, but I don't want to taste any one ingredient too much. Add what it needs and mix thoroughly. Then top the mostly cooked meatloaf with this glaze, I like to cover the whole surface and sides, if the meatloaf is large, I may make a bit more glaze because I really like the whole loaf to be coated. Put the meatloaf back in the oven to finish cooking. After glazing it should be about 15 to 20 minutes more to finish cooking. Use a meat thermometer, and follow guidelines for hamburger temperatures to check doneness, occasionally for a larger loaf I have to turn up the oven if it is not reaching temperature, but be careful once the glaze is on, since it is sugary it will burn if the oven is too hot. The topping will be bubbly but not too dark. We enjoy our meatloaf with the classic mashed potatoes and green beans. Now that the kids are older we don't have left overs, but if you do have left over meatloaf, it makes an excellent sandwich the next day! This classic meal is always welcome at dinner time and the whole family loves it. Your meatloaf looks really good! Thanks for the recipe!